It’s been almost a year since the U.S. military lifted its ban of social media sites. Troops don’t necessarily have free reign, however, as commanders at any level can still institute a temporary ban on specific sites. Along with the ban lift came specific branch policies for social media use, such as the Navy Command Social Media Handbook and the New Media and the Air Force guide (PDF). 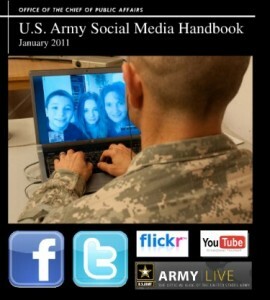 The Army has just released the Army Social Media Book 2011, a followup to last year’s 2010 Army Social Media Book. The 39-page document is nearly triple the length of its earlier version, and is available to view on the U.S. Army’s official Slideshare. The guidelines are needed because, as the book itself reads, “Today, social media is so widespread and transparent that you may already be involved even if you are not actively participating.” Some of them are obvious, such as maintaining operations security (OPSEC) as the primary concern. Guidelines include taking advantage of privacy settings on various social networking sites, verifying that “friend” requests are legitimate, and being careful about third-party apps on Facebook since it’s easy to unwittingly give them access to your personal information. Some are just suggestions, while others are outright rules. Posting or linking to content that breaks the Uniform Code of Military Justice (UCMJ) is prohibited, for example. Strangely, this is just a suggestion: “Consider turning off the GPS function of your smartphone.” Soldiers are also encouraged to refrain from using geotagging in their social media posts and from using location-based apps. The book also advises, “When using social media, avoid mentioning rank, unit locations, deployment dates, names, or equipment specifications and capabilities.” There are guidelines specific to Army leaders, too, such as treating blog inquiries as media requests to be coordinated with the public affairs officer. “Social media can keep the public informed, it can keep Families connected and it can help address negative news stories and inaccurate reports,” the book reads. One of the examples given is the rampant misinformation spread through social media after the Fort Hood shootings in 2009. The Army used its own social media outlets to release accurate information more quickly than traditional media. The Army Social Media Book 2011 offers examples of some of the branch’s officers who are utilizing social media in exemplary ways, such as General Ray Odierno, Lieutenant General Frank Helmick, and Sergeant Major Kenneth O. Preston. It also commends Army Chief of Staff, General George W. Casey, Jr., who carries a flipcam and conducts interviews with soldiers, which he then posts on the official Army YouTube channel. Our adversaries are trolling social networks, blogs and forums, trying to find sensitive information they can use about our military goals and objectives. Therefore, it is imperative that all soldiers and family members understand the importance of practicing good operations security measures. Check out Tatyana Meshcheryakova’s post here on SixEstate from last October for a list of official Army social media sites, including Flickr and Twitter. U.S. Army logo, screen capture of Twitter status, and Army Social Media Book 2011 cover used under Fair Use: Reporting.